Been diving in Deep Six? Please Vote! Deep six is one of the best so-called boulder sites of the Similan Islands National Park. This dive site has a depth of around 30 meters and is made up of a collection of boulders that are partially submerged. It often has quite strong current and so is commonly completed as a drift dive by experienced divers. There are many swim throughs near the boulders and there is a large arch that has many swim throughs surrounded by sea fans and whip corals. The scenery is really good and divers will get fantastic views of some of the best topography in the area. Within the nooks and crannies of the dive site, divers can commonly spot crustaceans and pipefish hiding amongst the corals. The boulders often are home to sea snakes, octopus, and mantis shrimps. 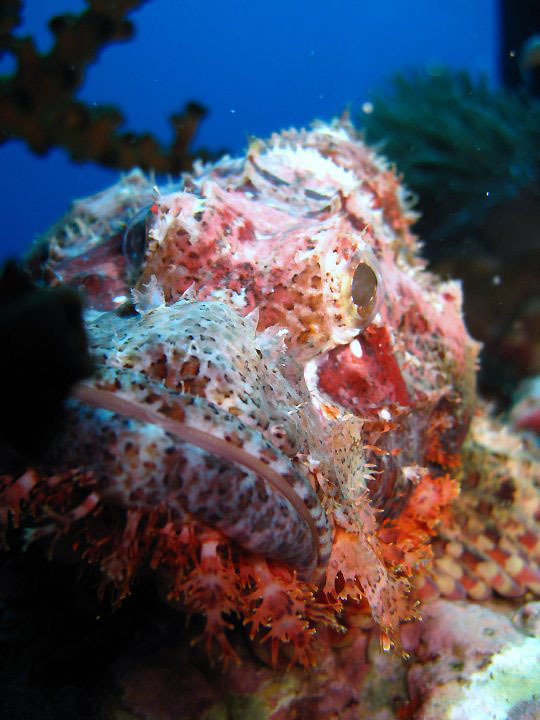 Divers can also fund large groupers and sweetlips lurking under the table corals and sometimes under the rocks. In some of the deeper areas, divers can see white tip reef sharks and blue spotted rays. Occasionally large rays such as manta rays also make an appearance. 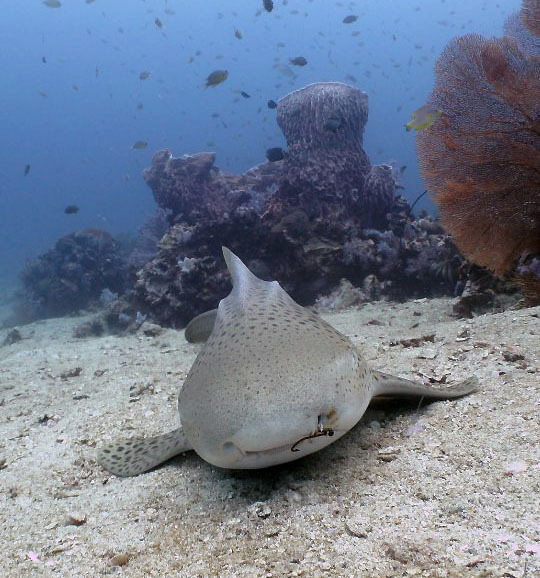 Some areas of the dive site are protected from the currents, and sometimes leopard sharks can be found in these areas when the current is low. This must be one of my favourite sites in the Similans probably due to the first time I dived there. My first dive on this site was back in 2001 and it did not disappoint, leopard sharks sleeping lazily on the sandy area, white tips under the ledges and multiple turtles surfacing for a gulp of air before re-submerging to carry on there feeding fest. With the amazing coral gardens hiding in the centre of the many swim-throughs you would think this was enough special things for 1 dive. But Deep Six carried on to thrill us with a 4m Manta swimming around us whilst we were hanging on the line for the safety stop, we must have stayed much longer than the minimum 3 mins needed. At the north tip of Island 7 this boulder site is covered in soft corals. It has amazing swim-throughs and a hidden coral garden. Map of Similan Islands, Deep Six dive site.